Procheck Electrical's staff are fully qualified to the 17th Edition of BS7671, and are independently assessed annually by Part P governing body, NAPIT. We are able to undertake all aspects of electrical work, and all work is fully insured. 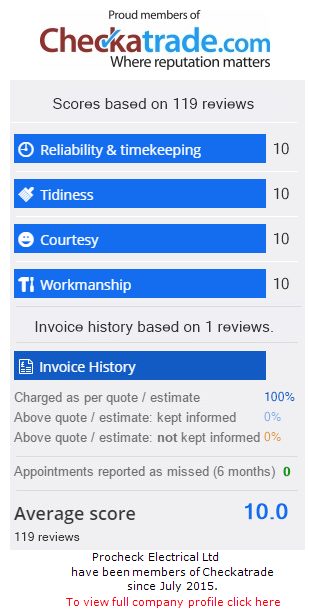 A member of the Derbyshire Councils Trusted Trader scheme with a 100% good review record and listed on the ElectricSafe register, you can be assured of a quality job completed by a qualified electrician with many years experience. We will be happy to show you recent examples of our work and can arrange informal meetings to discuss your needs. We hold testing contracts with Dronfield Town Council as well as many schools in the area. Please contact us for any electrical testing requirements.